With the release of windows 8, all of the new phones and tablets will start popping up and showing their wares, firstly though a look at the much anticipated Nokia phone with windows 8. 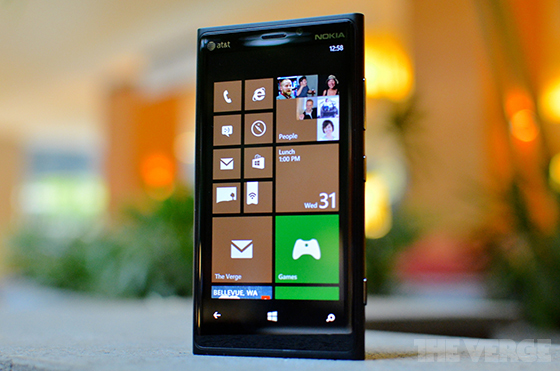 The Nokia Lumia 920 is the company’s third attempt at launching the definitive Windows Phone. In April, Nokia and Microsoft tried to convince the world that the Lumia 900 and Windows Phone 7.5 was that device, but that claim had a shorter expiration date than anybody realized. Its days were numbered, as Windows Phone 8 was an under-the-hood overhaul that wasn’t compatible with the phone. The Lumia 920’s launch was mishandled at best. The compelling PureView camera was undercut by a marketing snafu when Nokia faked a video purporting to show its low-light capabilities. Neither Nokia nor its carrier partners could commit to a firm release date, and potential buyers have had to wait nearly two months to purchase the phone. In that time both the iPhone 5 and the Nexus 4 appeared on the scene — the competition has not stood still. Though the Lumia 920 stumbled out of the gate, it still aims to be the long-shot, dark horse surprise of the smartphone race. Can Nokia pull it off? Read on for our full review. I’m just going to say this bluntly: the Nokia Lumia 920 is a tank of a phone. It’s a big and heavy device, weighing in at 185 grams and 10.7mm thick — compare that to the 112 gram, 7.6mm sliver that is the iPhone 5 and you get a sense of how large this phone is. It also has a relatively capacious 4.5-inch screen with large bezels on the top and bottom, adding up to a height of just over 5.1 inches. 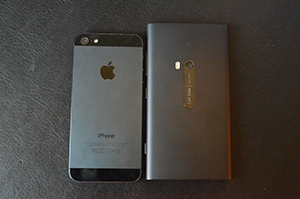 Even if you only compare it against its Windows Phone counterparts, the HTC Windows Phone 8X is nearly as thick as the Lumia 920 at its thickest point, but it’s much more tapered and weighs much less. There are ostensibly good reasons for the Lumia 920’s weight and size: a large battery, 4.5-inch screen, wireless charging, and PureView camera hardware all take up plenty of space. With time, the heft of the phone did eventually start to feel OK. A generous and charitable person would call it “substantial,” and if you’re willing to make the tradeoffs Nokia is proposing here you may even come to find that substance almost reassuring. 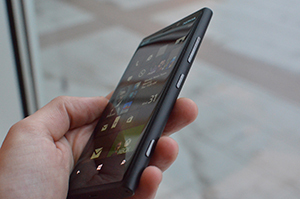 It helps that the Lumia 920 has standout industrial design. Like the Lumia 900 and the Lumia 800 before it, it’s composed of a polycarbonate unibody shell that wraps all the way around the device. The top and bottom are flat and squared-off, with the headphone jack squarely in the top-center and the microUSB jack bottom-center and flanked by grilles for the speaker and microphone. The finish on the polycarbonate shell varies depending on color. The black and cyan models are elegant and scratch-resistant, though my unit had some minor imperfections with the finish on the bottom. It also comes in red, white, and yellow, each of which come with extremely glossy shells that I personally find garish and off-putting — but some on The Verge staff (with admittedly more refined fashion sense than I) still liked them. 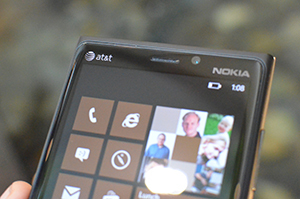 As with the Lumia 900, the entire phone feels like a single, solid unit with seams in the shell only where absolutely necessary: around the screen, buttons, and ports. 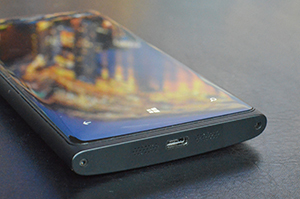 The buttons are all located on the righthand side, with the volume buttons on top, the power beneath them, and the usual Windows Phone camera button at bottom. Those who switch from other phones may need a few days to get used to the placement of the power button, but it’s still more convenient than buttons placed on the top. Smartphone manufacturers take note: if your screen is bigger than 4 inches or so, put the power button on the side. The Gorilla Glass front is gently curved to fit into the overall shape of the phone. The usual three capacitive buttons sit underneath the screen, backlit in a slightly off-white color that’s only discomfiting once it’s pointed out to you. The Lumia 920 isn’t quite the revelation in phone design that its predecessors were, but it’s in a class above the vast majority of smartphone models on the market today. One of the features Nokia is pushing hard is support for wireless charging, based on the Qi standard. It works as advertised, but I found myself wishing Nokia had followed Palm’s (and now Google’s) lead by putting aligning magnets inside the phone. Instead you have to lay it flat and wait for the tell-tale “ding” that you’re successfully charging. NFC is also onboard, and I was able to share links and contacts and the like with no issues. You know that guy who walks into the coffee shop and unapologetically slams down a gigantic, 17-inch monster of a laptop on the table, declaring “This thing is a beast, but I don’t care.” That’s the Lumia 920. It’s a muscle car. It’s a monster truck. 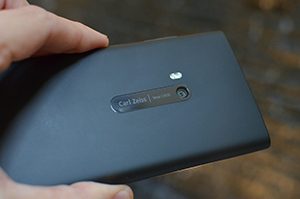 Unlike the Lumia 900’s AMOLED display, Nokia opted for an IPS LCD display on the 920. Nokia has clearly spent a lot of time perfecting the screen, paying attention to how close the pixels are to the surface and even tweaking it so that you can use it with gloves on. It won’t work with thick, winter gloves, but touches through thinner material register on the device — it’s a bit of a gimmick, but it’s one that works as advertised. I can’t help but poke fun at smartphone manufacturers touting subtle refinements in their LCD displays with abstruse marketing terminology — and today it’s Nokia’s turn. Nokia calls this a ClearBlack display, which consists of polarizing layers of glass to help make blacks deeper and reduce reflections. It’s technology that was introduced back in 2010, and here it doesn’t seem to have much effect. The blacks on the 920 aren’t nearly as deep as on the 900 — but the tradeoff is well worth it in my opinion. I’d rather take a visible black background than the blown-out colors I too often see on AMOLED displays. The new addition is “PureMotion HD+,” which is Nokia’s branding for reducing latency and guaranteeing 60FPS on animations — with scientific papers backing it all up. Well, the phone seems to live up to those marks: swiping around in Windows Phone 8’s various screens yields sharp transitions with crisp motion. If you’re basing your smartphone buying decision on such things, the 920 is your phone. Also, I’m really, genuinely curious as to what makes you tick. Marketing aside, this screen is gorgeous. It’s a 4.5-inch IPS LCD display with a resolution of 1280 x 768, offering a slightly higher pixel density than the iPhone 5’s Retina Display. Text is crisp and though the pixels don’t appear to sit as close to the surface as on the iPhone 5, the difference is minor. Really, the only knock I can deliver against it is that it does dim a bit when you’re looking at it at sharp angles. Given that the ClearBlack technology involved polarizing the glass, it’s not a huge surprise nor should it cause problems for users. Nokia stirred up a mini-controversy back in September when it announced the Lumia 920 would come with the same PureView branding as the 808 Symbian handset but without the corresponding 41-megapixel sensor. What does PureView mean, you might ask, if it doesn’t denote the earlier handset’s crazy oversampling technology? Stephen Elop’s answer was that the label represents the very best from the Finnish company’s imaging department, and while that might be a little bit of marketing doublespeak, there is some truth to it. 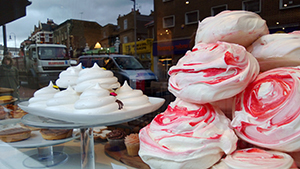 The common thread between the PureView 808 and the 920 cameras is excellent image quality for those who know how to handle a high-end camera. Nokia’s newer device does have a few foibles you’ll need to be aware of, but if you are adept at handling its ideosyncracies, you can get amazing results. 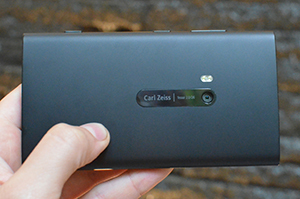 There are two major categories in which the Lumia 920 excels: low-light performance and image stabilization. Both rely on what Nokia calls “floating lens technology.” In a first for the mobile world, the entire optical assembly inside the 920 is suspended on tiny springs, which absorb and dampen the movements of your hand as you shoot. By reducing camera shake in this fashion, Nokia can afford to keep the shutter open for longer, absorb more light, and deliver much brighter pictures. That’s not going to eliminate all blur from your images, however, as moving subjects will still appear smudged if the picture isn’t taken quickly enough. Another thing I noticed is that camera shake can still make itself apparent in photos, even with this optical image stabilization — you’ll need steady hands to get the sharpest pictures from this device, particularly if you intend to use the physical shutter key. A great camera for pros, but what about the rest of us? Video recording is also a big beneficiary of the new floating lens, making for much steadier pans and allowing you to move around without destroying the quality of your video. The Lumia 920 isn’t going to compete with a dedicated camcorder in that respect, but it represents a significant step forward for cameraphones. Low light pictures on the Lumia 920 not only appear brighter, they’re also well detailed and exhibit little noise. While photography purists will appreciate Nokia’s restrained post-processing — which may make photos appear muted in comparison to the typically oversaturated results you get from other phones — they’ll be less enthused about the 920’s automatic white balance. Taking three shots of the same scene can sometimes produce as many as three different color temperatures: a beige coffee table appeared rosy in one image, a greenish yellow in the next, and the perfect pale taupe in the third. 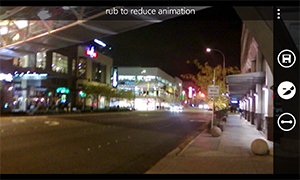 This same issue is apparent during video capture as well, with the camera sometimes tinting the entire scene into a new palette as it determines a new color balance. A legitimate criticism of Nokia’s 808 PureView camera is that while it can take amazing shots, it really requires the hands of a very knowledgeable user to pull them off. That same complaint applies to the Lumia 920’s camera as well. To most eyes, the images look a little washed out and don’t “pop,” with not enough warm tones. A studied pro might say that they’re more accurate and true to life, but the vast majority of smartphone users don’t want to think about the nuances of optical imaging stabilization, they just want to take photos. Nokia is also offering some software as exclusives to the Lumia line. The “Lenses” show up as options in the camera app, allowing you to launch custom camera apps directly and have their photos saved in the Photos Hub. “Smart Shoot” takes several photographs in succession and then has a post-processing mode that allows you to select the best shot and then cycle through faces to get rid of blinks. It produces good results so long as you hold the camera steady. “Cinemagraph” lets you create small animations just like the ones you can made with Cinemagram on iOS. The difference, unfortunately, is that Nokia hasn’t built any way to actually share the animations, a completely perplexing foible in an otherwise neat feature. The biggest and most important change to Windows Phone 8 over previous versions is one users don’t see directly: internal software plumbing shared with Windows 8. Microsoft likes to say that it has managed to change the engine on a car speeding down the freeway without slowing down, and the metaphor is an apt one. It’s remarkable that an OS can have its internals so radically changed and yet still feel the same on the outside. The Lumia 920, along with the rest of the latest batch of Windows Phone 8 devices, benefits from that updated core primarily because it can now run on a modern processor, Qualcomm’s dual-core Snapdragon S4 clocked at 1.5GHz. It’s actually a little difficult to gauge just how much of an effect that speedy processor has, for a couple of reasons. The first is that Windows Phone has always been built with responsiveness in mind, so improvements in animations and scrolling are subtle. 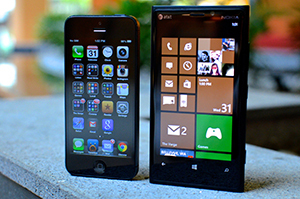 The second is that Windows Phone 8 as an OS seems to be faster and more stable overall. Microsoft has definitely made some performance tweaks, improving scrolling and responsiveness throughout the OS. 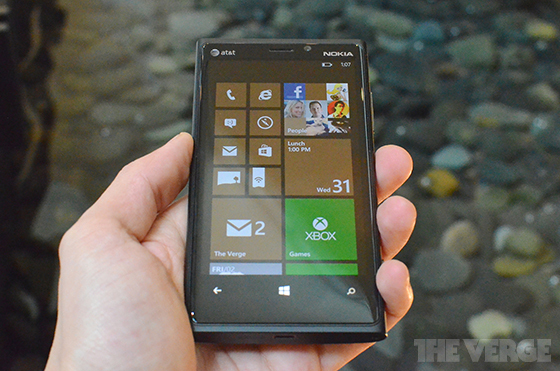 Windows Phone 8 as a whole is a curious mix of incredible speed and maddening delays. Apps still take longer to boot from a cold start than they should, but once they’re open every swipe and tap engenders an instantaneous response. Granted, the last few apps you’ve opened do load immediately thanks to fast resume feature that was added in Windows Phone 8, but I’m still spending way too much time looking at spash screens. To go back to Microsoft’s metaphor, it may have changed the engine but that has kept the company from devoting resources to overhauling the transmission. The good news is that there’s a real feeling that the base here is much better than it was before and that there shouldn’t be anything to hold the company back from improving the OSes imperfections going forward. I have no complaints whatsoever about battery life. Even running LTE full-bore, I was able to get a full day’s use out of the Lumia 920. It’s not in the same class as the Droid RAZR Maxx HD, but it’s a small step above most LTE phones I’ve used. It has a 2,000mAh battery, 200mAh more than the 8X, and that relatively small bump makes a big difference in terms of my peace of mind. The speaker on the Lumia 920 is loud but obviously doesn’t exhibit much bass, and strangely it can get much louder when playing music than it can on speakerphone. Call quality was uniformly good, but I’ve had intermittent issues with reception, especially on LTE. Nokia tells me that this unit is technically still running preproduction software, other 920 users I spoke to didn’t have the issue, and finally AT&T in Seattle generally seems lackluster, so I’m not willing to say definitively that there’s a real problem here. Still, I found myself toggling Airplane mode to kick-start the radio a few times and it’s something to keep an eye out for when retail units start shipping. We’ve already fully-reviewed Windows Phone 8, but using a Nokia Lumia phone can be a very different experience from the base OS. Nokia is aggressively adding its own software to the platform and just as aggressively courting third party developers for exclusives. The result is a slightly better experience on the Lumia than you can get on either HTC or Samsung. In terms of third party apps, Nokia has a section of the store with entries like Groupon, Mirror’s Edge (yes, it’s old, but it’s so good), ESPN, and a few others. But it’s the first-party Nokia titles that really shine. Nokia Transit and Nokia Drive provide real options for navigation, while Nokia City Lens is an augmented reality app that makes for a good demo but isn’t the most useful way to get around town. Nokia Music provides free streaming, but if you’re on Windows Phone you really should be subscribing to Xbox Music Pass anyway. 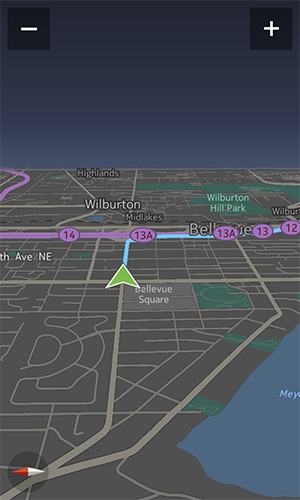 The biggest addition is Nokia Maps, essentially a super-charged version of Bing Maps. The main feature it offers is the ability to save maps offline, but you also get indoor maps of popular venues, more augmented reality, and voice-guided turn-by-turn directions. 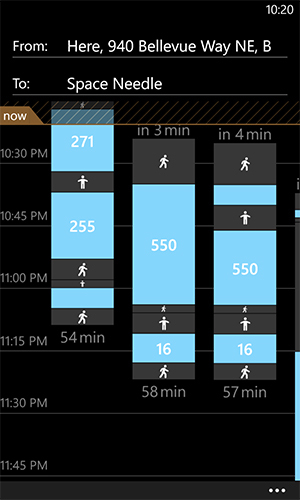 Nokia has tweaked the interface a bit as well, with a swipe-up offering listed options for your location. 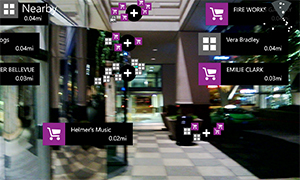 Unfortunately, the way that Nokia Maps is implemented on the Lumia 920 is imperfect. Although the original Maps app is no longer listed on the apps list, it’s still hiding on the phone. Tapping an address link in Outlook launches it instead of launching Nokia Maps, which is likely to be a cause of genuine confusion for many users. The AT&T version has a few AT&T apps pre-installed, but luckily they’re just a long-press away from being jettisoned from your phone. Microsoft deserves credit for not allowing carriers to break the core experience with un-removable apps, something Google once promised it would do on Android but has failed to deliver on. Even with all of Nokia’s enhancements, the same issues that we mentioned in our Windows Phone 8 review still apply: there’s a serious dearth of apps when compared to iOS and Android — and I’m not just talking raw numbers but popular apps that are table stakes on other platforms. Just as Internet Explorer 10 gets unfairly treated as a second-class citizen by many websites, developers are giving this platform short shrift. It’s up to both Microsoft and Nokia as the standard bearers for the platform to make the case to those developers that Windows Phone 8 is worth their time, and unfortunately they’re still working on that. Many of the frustrations we used to have in Windows Phone are now gone with this latest version, and Nokia has given the OS a very good stage with the Lumia 920. The speed and multitasking improvements, connections to Xbox and SkyDrive, and Start Screen experience are all much better, but there’s still a critical lack of apps and they too often feel as though they’re not as good as what’s on other platforms. It’s fitting that I’m reviewing the Nokia Lumia 920 while Microsoft’s Build conference is going on here in Redmond. Microsoft has resolved many of the developer complaints with Windows Phone and is aggressively courting them to bring more and better apps to the platform. The work to bring Windows Phone 8 up to par is happening all around me — and it needs to keep happening. With its new core, Windows Phone 8 is in many ways a completely new platform that should enable rapid innovation — and users will need to continue to wait for it to come into its own. The Lumia 920’s hardware and design is top-notch, the screen is lovely, and the camera is a marvel in low light — but you can’t ignore just how big and bulky the phone is. The software and hardware tradeoffs inherent in the Lumia 920 could be worth it if you’ve bought into the Microsoft ecosystem, but for most people I don’t think it’s a sure bet. Tom Warren, Josh Topolsky, and Vlad Savov contributed to this review. 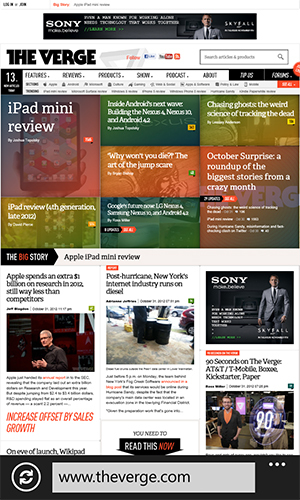 More times than not, the Verge score is based on the average of the subscores below. However, since this is a non-weighted average, we reserve the right to tweak the overall score if we feel it doesn’t reflect our overall assessment and price of the product. Read more about how we test and rate products.